If you've been reading this blog for more than a week, you know what to expect today, right? Yup, pictures from my weekly Saturday morning visit to my favorite store, Costco. Before going into the warehouse, I filled up my tank at their gas station, $3.359 per gallon. Prices have steadily come down, yet if the price for a barrel of oil is about 50% of what it was at its high point, why hasn't the price of gasoline followed suit? 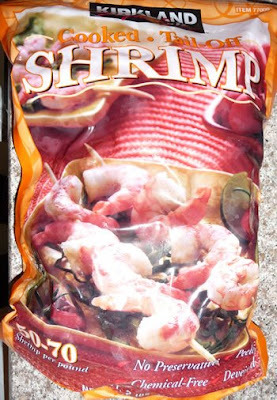 I got a bag of 50-70 count cooked and peeled shrimp for when we don't feel like going to much trouble to cook anything. It's also good for fried rice.. There was a discount coupon for Airborne so I bought a package. It doesn't seem to work for me (maybe because I always take it too late) but Julie says it works for her. I don't know if announcing it was developed by a schoolteacher is a good or bad thing, haha. 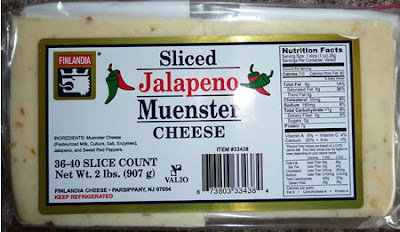 I bought this jalapeno muenster cheese to try and liven up my boring turkey sandwiches. Since I temporarily have to go into the office five days a week instead of three days, that means turkey sandwiches five days a week as well so hopefully this cheese will add a kick to it. I must have stood at the counter comparing calories and nutritional values for five minutes before finally picking this one. I think I need to get a life..
Another coupon went towards this bottle of chewable vitamin C. The one we have now isn't chewable and I don't like it that much because it doesn't taste as good. No, I don't use Flintstones vitamins but maybe I would if I ever tried them. I did used to have my daily Chocks, though. 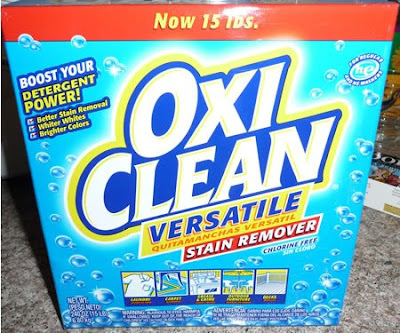 And the final coupon was used for this heavy box of Oxi Clean. Does this stuff really work? I don't know. I'm the type who would throw all my clothes, dark, light or white into one load to save time if it didn't horrify Julie, so don't ask me. It doesn't hurt to use it, I guess. This afternoon we took a trip to the garment district with Sanjung, our choir director, and another choir member, Glenn. He's a fellow Dorsey alumnus, having graduated in 1969. On the way there, he told me that he was the valedictorian for his graduating class at USC in 1973 - quite impressive (even if it is only USC, haha), especially since he's such a humble, unassuming fellow. He was also accepted at UCLA and Cal Tech, so I asked him why he would want to go to USC if he got accepted to these other two schools. He said it was because UCLA had too many people with strange philosophies on life, and Cal Tech required that students live on campus, which he didn't want to do. Here's a picture of one of the pennants telling everyone where they are. 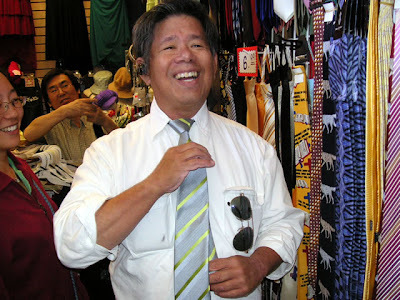 And here's Glenn trying on a "zipper tie," just for the experience. That's Sanjung partially hidden on the left. She's even more humble and unassuming than Glenn is, but she is mucho talented! Prices were pretty low down there. I saw plenty of socks, starting at 6 pairs for $10 at one vendor,and progressing to an extreme of 24 pairs for that same price on another vendor's table. About every 50 feet there was a hot dog cart; all of them sold the exact same kind of hot dogs with the exact same trimmings. They sure did smell good. 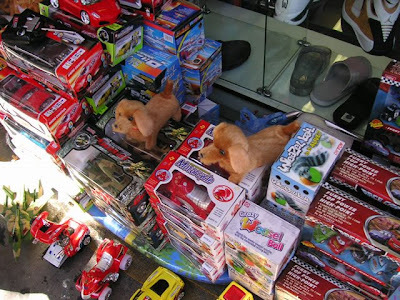 And another picture, this one not of garments or cloth, but toys. I hadn't been down there in over 30 years, not since my college days when Amy and I would shop at Beno's and a few other places. I remembered absolutely nothing, although maybe the place is entirely different now. Take away the people and it could have just as well have been one of those flea markets in Hong Kong or Beijing. There really wasn't anything of much quality to be seen. 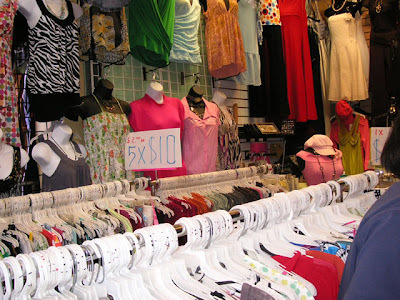 That made me wonder - are the bazaars and open air markets in other countries all the same as well? They seem so exotic, yet maybe there's no real mystery or intrigue, just a bunch of cheap stuff. Maybe that market Ingrid Bergman was shopping at in Casablanca only had things made in China. 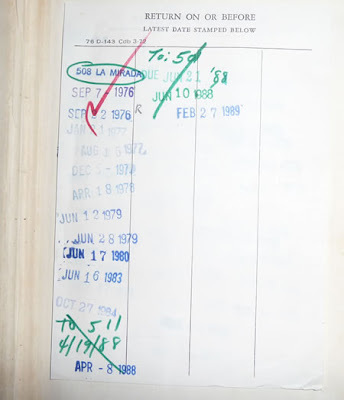 Oh, and I stopped at the library and picked up that book I mentioned a few posts ago, The Interrupted Journey - the story of Betty and Barney Hill, the couple who claim to have been abducted by aliens from outer space and taken aboard their spacecraft. 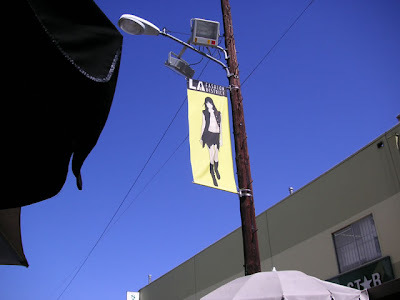 Evening time was another LOUD dinner at a Chinese restaurant, this time Hop Woo in Alhambra. I shoulda taken my book inside to read but I left it in the car. I thought the food there was much better than the way pricier King Hua down the street, with better menu choices. There goes another Saturday. Even though Julie wanted to take another trip back down to the garment district soon, I think I can do without for another 30 years. But then maybe there's really intrigue and mystery going on behind the scenes down there that I'm not aware of.